The hybrid tech-meets-plant Beauty Bungalow spa offerings were researched and formulated by Denise to cater to clients of diverse ages and backgrounds. She believes in an integrative approach to skincare and applies this philosophy to all aspects of her life. One treatment at the Beauty Bungalow and you’ll leave feeling an overall sense of well being that transcends far beyond the surface. With over twelve years of experience in the beauty business – from working with award-winning Bliss Spa in NYC, to training as a medical aesthetician, then later becoming certified in holistic philosophy by the DERMED College of Advanced Aesthetics – Denise blends plant-based skincare with cutting edge rejuvenation technology. She views skin like a roadmap, guiding her to what each unique client needs to achieve long-term radiant skin. In addition to specializing in holistic therapies, Denise worked with one of Tampa Bay’s leading plastic surgeons and gained extensive medical aesthetic experience performing all levels of chemical peels, laser, microneedling, microdermabrasion, ultrasound and microcurrent skin tightening treatments. Denise seeks to live a beauty-filled lifestyle and loves practicing yoga, experimenting with fresh recipes in the kitchen, and exploring St. Pete, the vibrant city that she loves! 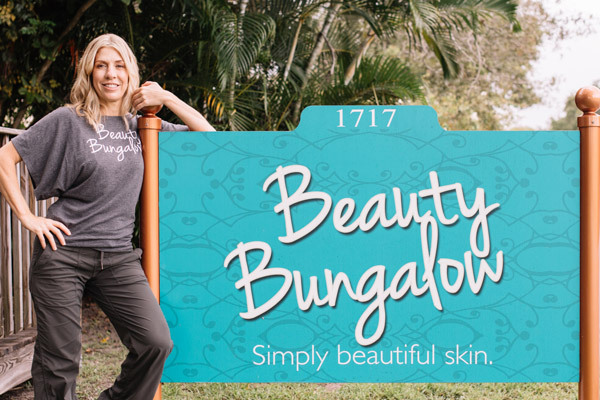 Owning and operating the Beauty Bungalow is her joy and it’s her mission to provide a space where clients can unwind and enjoy exceptional skin healing. Let’s “Keep St. Pete Beautiful”, together! We love connecting with the community by hosting collaborative skincare education workshops, pop up events, skin health beautyfood dinner parties and more. Contact us and let’s co-create!